We’ve considered these plants pests for so long that it’s hard to change our minds. Here are some reasons why you might like to think of them differently. 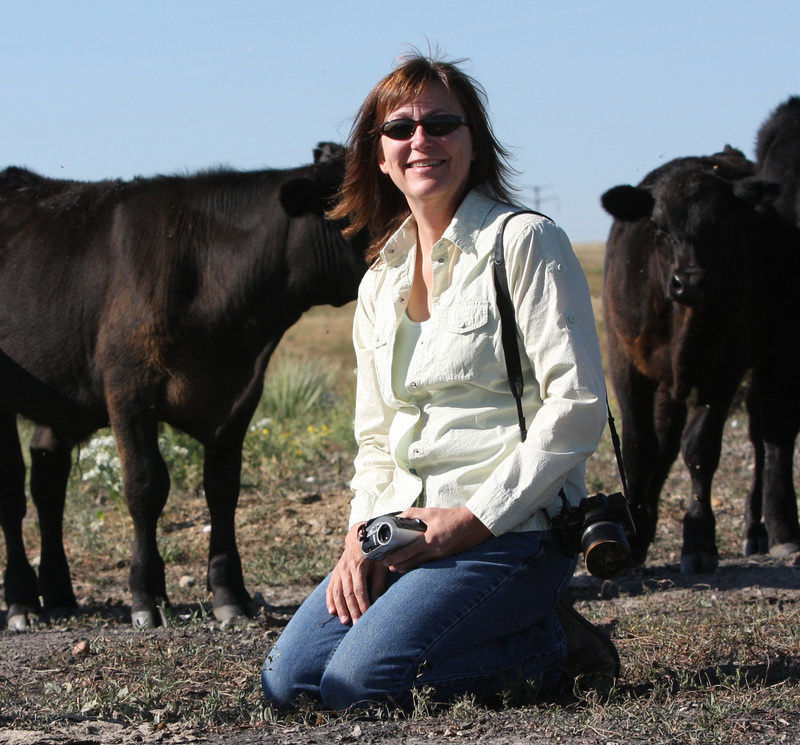 Kathy Voth developed a method based on animal behavior science to teach cows or any ruminant to eat weeds. She shares information on weeds as forage and how to work with animal behavior in On Pasature on an ongoing basis. Forage quantity, quality and cost limit how much livestock a producer can raise, and how much money he/she makes doing it. Our emphasis on pasture grasses has led to decades of research to improve grass varieties, and farmers and ranchers have sprayed, burned, mowed, seeded, and invested in the necessary equipment for all this in an effort to increase the quantity and quality of pastures. Economist John Morley found that, based on average pasture weed populations, if a producer’s cattle ate just 70% of the weeds available, that producer would have about 43% more forage. This is just an average and your percentage will be different based on your past weed management practices. But quantity isn’t limited to just what is in the pasture at the beginning of the grazing season. Graziers want to know “Do weeds regrow the same way we count on pastures grasses to do?” The answer in many cases is “Yes.” Depending on the time of year, every weed I’ve seen grazed by cattle has responded by producing more stems or buds. 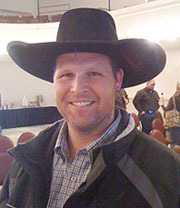 Nevada Rancher Lance Knudsen provides a good example. In 2011 he trained his cows to eat Whitetop/Hoary Cress and during the drought of 2012 said that “Whitetop has become a really good source of feed this year when the grass isn’t doing much because of drought. We graze it before it seeds out and it just keeps growing back. After just a week and a half we have 6 to 7 inches of regrowth and we can put the cattle in again.” This is in an area receiving little to no precipitation. 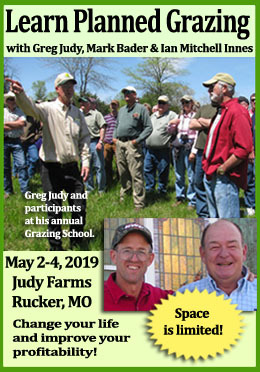 He said he’d already grazed that pasture three times for the 2012 grazing season, when typically he can only get one week’s worth of feed from it. His cattle began eating all the thistles in his pastures as well without any additional training. He noted that as soon as the cattle graze the buds off the tops of the musk thistle stems, the branches below produce buds, and when the cattle eat those buds, the branches below them produce more buds. “So feed is being created as they graze it,” he said. 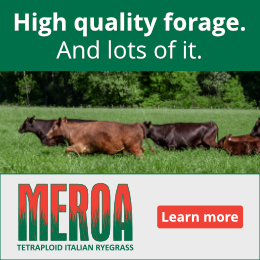 Weeds are also high quality forage, maintaining much higher levels of protein through the growing season than typical pasture grasses. Because they have a higher leaf to stem ratio than grasses, they generally have better digestibility numbers as well. 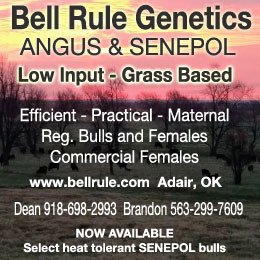 A maintenance ration for cattle requires 8% protein, so when grasses dry in mid-summer and drop below 8%, weeds can provide the protein cattle need to maintain, or even to gain weight. 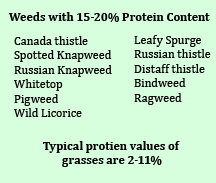 Higher levels of protein in weeds can also provide the nutrients rumen microbes need to process lower quality forages, so we can take advantage of forage that might not otherwise have been useful. Weeds are a free, and widely available forage. In addition to being nutritious, they are often available when other forages aren’t either because of the time of year, or due to drought conditions. They reseed themselves with ease, and require no effort at all on our part to grow. Changing our minds about forage and weeds is probably the most difficult part of the entire training process. Our centuries-long War on Weeds has left us all with an ingrained hatred of our “enemy.” Even when we know that weeds are a high quality, resilient forage, most producers continue to think of grazing them in terms of eliminating or reducing them. If you don’t feel comfortable taking the step of thinking of weeds as just another forage, don’t let that stop you from deciding to teach your animals to eat them. Just think of using your livestock as less expensive tool for reducing and managing weed populations. The second most difficult step is learning how to be a successful trainer. I’ll be sharing more information on the training process in future articles. You can also visit my website for more information.